Whattay way to start the week! It might be Monday, but it’s a sunny September morning, I’m pleasantly hungry, and, almost a year after it opened its doors, I’m finally due to dine at Gymkhana. And, when I’m led down to the beautiful bunker that is the private dining room, the bespoke Amira rice menu I feast my eyes on makes my mouth water. I’m already enthused, but making an instant friend in Ashanti Omkar is the varq on the kheer. The ebullient, effervescent broadcaster tells me she will shortly start a Sunday afternoon show on South Indian culture on BBC Asian Network… and that Amira’s CEO Karan Chanana makes the most incredible chocolate. I feel she has my number. Of course one must break bread with new acquaintances post haste – or, in this case, crunchy rice pappads with a trio of chutneys, amongst which I don’t scrimp on the tomato and shrimp. 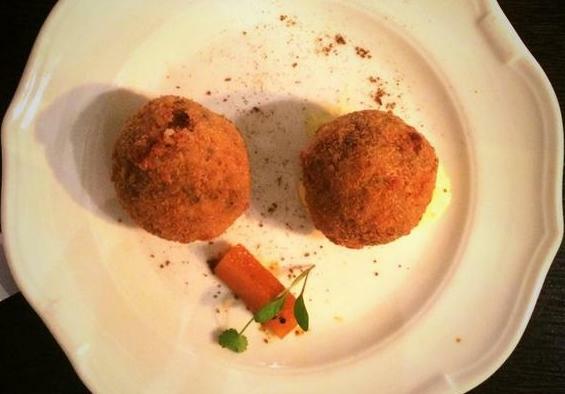 After my recent forays into French-accented Indian food, today it’s Italy in the mix; in the form of fried, breaded balls of dal chawal that call to mind arancini. Karan speaks about his rice, but by this stage, we know it’s nice – and are all eager to try it in every incarnation. ‘Soft-shell bhel’ is the first encounter many of the merry munchers have with the grain in its puffed form, known variously, regionally – and not exclusively -, as mamra, muri, pora, murmuralu, lia, and mandakki. Resembling a superior Rice Krispie, here it’s tossed with selected spices and forms a bed for a briskly-fried soft-shell crab. The flattened rice flecks called poha, aval or chira go down as well as the bhel. I’m often heard beating people about the head with evangelical exclamations about the glories of beaten rice, but today I remain silent and focus instead on stuffing my mouth with as much of this marvellous mixture as possible. This peanut-studded poha is made in the Maharastrian manner, with the unorthodox addition of chicken chunks as a sort of ‘chaat’. Apt, perhaps, since it soon has us all talking as plates are scraped clean enough to render the kitchen porter redundant for this shift. 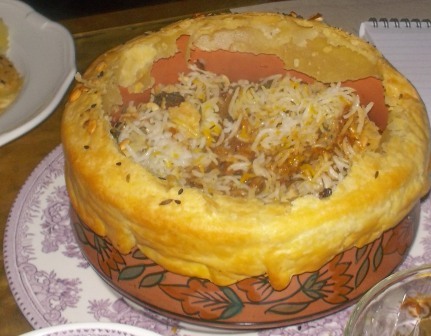 Of course, the main course of any rice banquet has to be biryani. 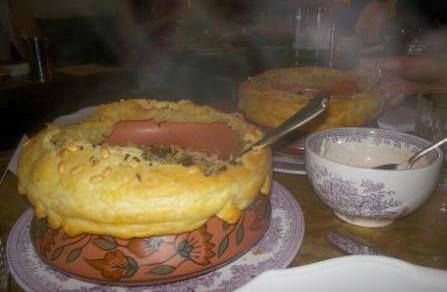 Especially at Gymkhana, where the version made with munjac meat is held in sky-high esteem. We wait, nostrils twitching, as waiters pierce the pastry lidding each dum-cooked portion, releasing clouds of fragrant steam into the room as they do so. So does this ludicrously-lauded biryani live up to the hype? Absolutely – and it comes with the added advantage (for this carb-craver, at least) of the seed-studded crust being offered alongside for one to discreetly eat. As the rice is the very jaan of biryani, the dish lives or dies on its quality. Here, it positively thrives. The spice is not only nice, but a lot more hot than many other examples. A cool spoon of the raita that’s right beside the biryani readies the mouth for another morsel of munjac – a meat that eats very well in this particular preparation, well-worth a go even if one is not wild about game. Gymkhana’s dal makhni is one of the best examples I’ve encountered… but after a few spoons I face the fact that the space should be reserved for rice. Which, unsurprisingly, features in the sweet. We dig into deep dishes of cool, creamy kheer; the purity of the simple rice-and-milk pudding allowing the aromatic qualities of best Basmati to take centre stage. By this stage, I suspect we’re all eating for greed not hunger; but mere physical satiation does not quell the appetite to imbibe just a bit more. I expect you’re still hungry, too – or, even, are hungry now even if you did not start so. 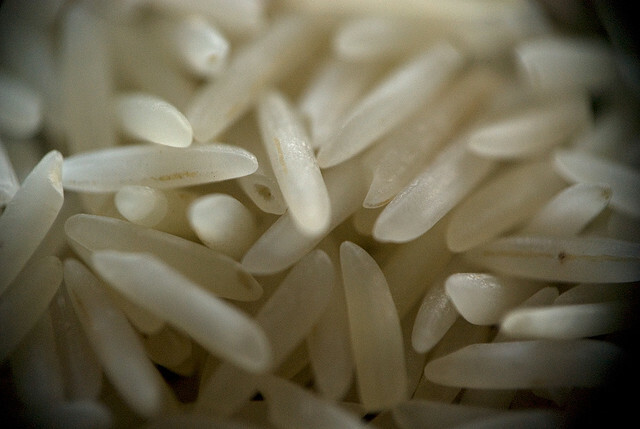 The ways in which rice is used across India’s length and breadth is a veritable smorgasbord. If you started eating now and never stopped, you’d barely scratch the surface. There are endless ways to relish rice. So rove to the stove – and look out for my exploration of unusual rice-based items from across India next week. Amira is a key supporter of The Akshaya Patra Foundation – an organisation that feeds 1.3 million Indian schoolchildren on just 5p a day. Learn more and lend your support here. Want advice on cooking perfect rice? A fair few experts share their secrets here. A bit about a Basmati conference in Delhi here. A guide to the various types of rice used across India here.